The report Sociability, Social Media for People with a Disability” was commissioned by the Australian Communications Consumer Action Network and Media Access Australia. 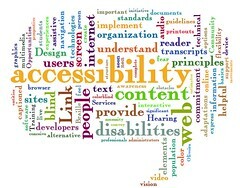 Their aim was to provide an insight into how people with disabilities can best use popular social media tools. • To gain an insight into the future trends of social media applications and their potential for consumers with disabilities. There seems to be a lot of good tips and tricks in this report. Let me know if you find it useful.